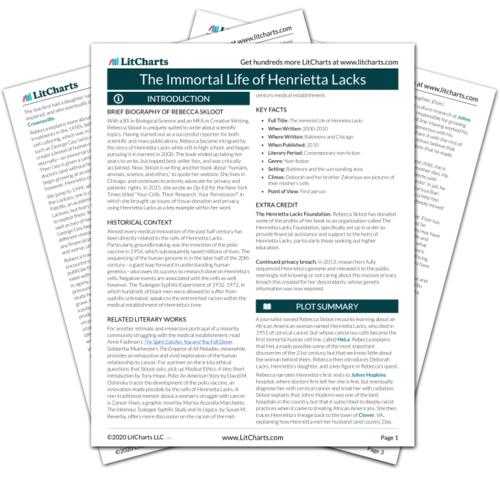 Welcome to the LitCharts study guide on Rebecca Skloot's The Immortal Life of Henrietta Lacks. Created by the original team behind SparkNotes, LitCharts are the world's best literature guides. A concise biography of Rebecca Skloot plus historical and literary context for The Immortal Life of Henrietta Lacks. A quick-reference summary: The Immortal Life of Henrietta Lacks on a single page. In-depth summary and analysis of every chapter of The Immortal Life of Henrietta Lacks. Visual theme-tracking, too. Explanations, analysis, and visualizations of The Immortal Life of Henrietta Lacks's themes. The Immortal Life of Henrietta Lacks's important quotes, sortable by theme, character, or chapter. 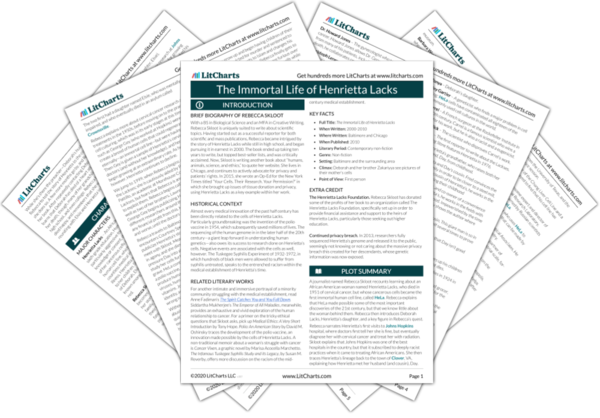 Description, analysis, and timelines for The Immortal Life of Henrietta Lacks's characters. Explanations of The Immortal Life of Henrietta Lacks's symbols, and tracking of where they appear. An interactive data visualization of The Immortal Life of Henrietta Lacks's plot and themes. With a BS in Biological Science and an MFA in Creative Writing, Rebecca Skloot is uniquely suited to write about scientific topics. Having started out as a successful reporter for both scientific and mass publications, Rebecca became intrigued by the story of Henrietta Lacks while still in high school, and began pursuing it in earnest in 2000. The book ended up taking ten years to write, but topped best-seller lists, and was critically acclaimed. Now, Skloot is writing another book about “humans, animals, science, and ethics,” to quote her website. She lives in Chicago, and continues to actively advocate for privacy and patients’ rights. In 2015, she wrote an Op-Ed for the New York Times titled “Your Cells. Their Research. Your Permission?” in which she brought up issues of tissue donation and privacy, using Henrietta Lacks as a key example within her work. Almost every medical innovation of the past half century has been directly related to the cells of Henrietta Lacks. Particularly groundbreaking was the invention of the polio vaccine in 1954, which subsequently saved millions of lives. The sequencing of the human genome in in the later half of the 20th century—a giant leap forward in understanding human genetics—also owes its success to research done on Henrietta’s cells. Negative events are associated with the cells as well, however. The Tuskegee Syphilis Experiment of 1932-1972, in which hundreds of black men were allowed to suffer from syphilis untreated, speaks to the entrenched racism within the medical establishment of Henrietta’s time. For another intimate and immersive portrayal of a minority community struggling with the medical establishment, read Anne Fadiman’s The Spirit Catches You and You Fall Down. Siddartha Mukherjee’s The Emperor of All Maladies, meanwhile, provides an exhaustive and vivid exploration of the human relationship to cancer. For a primer on the tricky ethical questions that Skloot asks, pick up Medical Ethics: A Very Short Introduction by Tony Hope. Polio: An American Story by David M. Oshinsky traces the development of the polio vaccine, an innovation made possible by the cells of Henrietta Lacks. A non-traditional memoir about a woman’s struggle with cancer is Cancer Vixen, a graphic novel by Marisa Acocella Marchetto. The Infamous Tuskegee Syphilis Study and its Legacy, by Susan M. Reverby, offers more discussion on the racism of the mid-century medical establishment. The Henrietta Lacks Foundation. Rebecca Skloot has donated some of the profits of her book to an organization called The Henrietta Lacks Foundation, specifically set up in order to provide financial assistance and support to the heirs of Henrietta Lacks, particularly those seeking out higher education. Continued privacy breach. In 2013, researchers fully sequenced Henrietta’s genome and released it to the public, seemingly not knowing or not caring about the massive privacy breach this created for her descendants, whose genetic information was now exposed. Hoyt-Disick, Gabrielle. "The Immortal Life of Henrietta Lacks." LitCharts. LitCharts LLC, 29 Jun 2016. Web. 24 Apr 2019. Hoyt-Disick, Gabrielle. "The Immortal Life of Henrietta Lacks." LitCharts LLC, June 29, 2016. Retrieved April 24, 2019. https://www.litcharts.com/lit/the-immortal-life-of-henrietta-lacks.